Drosophila NMJs form at axon terminals, and multiple motor neurons innervate muscle fibers (Figure 3.1D)3. Glutamate is the primary excitatory neurotransmitter in the fly NMJ. The individual synaptic units, termed "boutons," resemble beads on a string and decorate the terminal nerve branches. The presynaptic active zone appears as an electron-dense T-shaped bar surrounded by SVs (Figure 3.1B). Figure 3.1. The C. elegans and Drosophila NMJs. (A) Generic schematic of an NMJ. The active zone (AZ) is denoted by the presynaptic density (dark bar) and surrounding vesicles (circles). The regions of endocytosis (EN) and the vesicle pools (VP) lie near to the active zone. The periactive zone (P) surrounds the active zone. The active zone is juxtaposed against the postsynaptic receptors in the muscle (M) membrane. Extracellular matrix and signaling molecules (Ex) occupy the space between pre- and postsynaptic sites. (B) Electron micrograph of a Drosophila synapse (Type II) (courtesy of ref. 1). The presynaptic Drosophila T-bar specialization (T) can be seen at the active zone protruding into the presynaptic cytoplasm. Scale bar = 200 nm. (C) Electron micrographs of the C. elegans NMJ reveals ultrastructural characteristics of cholinergic and GABAergic NMJs. Cholinergic NMJs are smaller and synapse on both muscle (M) and neuron (N). GABAergic neurons are larger and synapse solely on muscle. Vesicle pools (VP) surround the electron-dense presynaptic density, which marks the active zone (AZ). Scale bar = 200 nm. Presynaptic vesicle pools (arrow heads) at NMJs along the nerve cord are visualized with SNB::GFP in C. elegans. These pools of vesicles correspond to regions of synapses along the nerve cord. Scale bar = 5 |im. 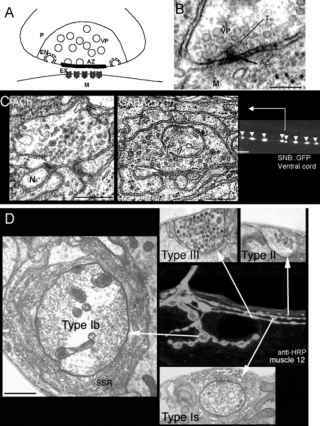 (D) Electron micrographs of the Drosophila NMJ reveal ultrastructural characteristics of three types of neuromuscular junctions. Type I axon terminals are short and contain 1-5 |im diameter boutons. The subtype Ib is larger than Is. Type II axon terminals are long and contain less than 2 |im boutons. Type III axon terminals comprise a small class of intermediate terminals. Scale bar = 1 |im. Individual boutons (arrows) are visualized with anti-HRP and appear like beads on a string (3.1.D courtesy of V. Budnik). ten-fold increase in bouton number and active zone/bouton ratio. Boutons grow in part by budding or splitting from existing boutons4. Based on the size of the synaptic boutons and the anatomy of the arbors, the NMJs fall into three classes (Figure 3.1D)3. Type I NMJs are characterized by short-terminal branches and large presynaptic release sites. Type II NMJs are characterized by long thin branches, numerous small neurotransmitter release sites, and contain a variety of vesicles including LDCV. Type III axon terminals comprise a small class of intermediate terminals. 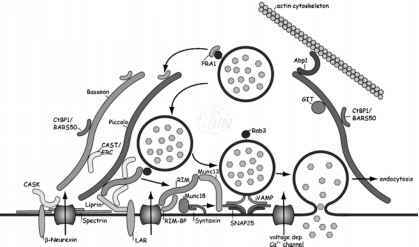 In larval stages, type I NMJs contain a convoluted specialization of the postsynaptic membrane opposed to the active zone called the subsynaptic reticulum (SSR). Glutamate receptors cluster in the muscle membrane at the postsynaptic site. Although glutamate is the major neurotransmitter and is present in all types of Drosophila NMJs, octopamine, proctolin, leukokinin I, and insulin have been implicated as additional neurotransmitters and can be found at a subset of Drosophila NMJs.